#LFA2017: When Did You Last Look Up? 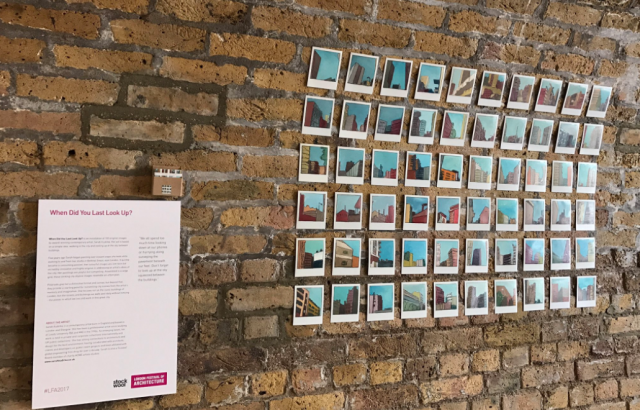 We are excited to announce that we currently have an art installation at the Pump House as part of this year’s London Festival of Architecture. When Did You Last Look Up? is an installation of 100 original images by award-winning contemporary artist, Sarah Kudirka. Her art is based on a simple idea: walking in the city and looking up at the sky between buildings. Five years ago Sarah began painting over instant snaps she took while walking to and from her studio in Bethnal Green, east London. It quickly became a consuming passion. Her colourful images are low-tech but incredibly innovative and highly original in addressing an artist’s ideas of the city. Her paintings are playful but compelling. Assembled in a large grid, these striking city skyline images resemble an urban plan. 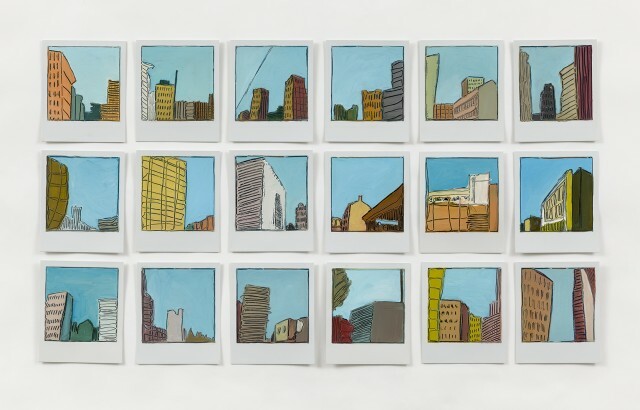 Polaroids give her a distinctive format and canvas, but beyond that, they provide a starting point for reinventing city scenes from the artist’s memory and imagination. She focuses not on the iconic buildings of London, but the streets and buildings we walk past daily without noticing – the places in which we live and work in this great city. The exhibition is open to the public throughout June, 10am-4pm Monday to Friday.